My Comments: Part of me wants to believe the Laws of Physics (and economics) have been reversed, that gravity no longer means ‘what goes up must come down’. The other half says gravity is still here. Wednesday afternoon, right after the election, I got a raucous tweet from someone making fun of my having said the market might crash soon. He/she was gloating as the market had risen solidly that day despite the expected woe and gloom. I’m probably going to get some more adverse comments from this post. If you really think ‘it’s different this time’, I think I can find you some really nice real estate just east of Daytona Beach? At a great price! There’s a ton of uncertainty going on across the globe these days, and if you really need your money in the coming years to sustain you, then it’s buyer beware time. The threat level is high, and I’m retreating to my cave. Stocks have been trading at exorbitant prices across a wide range of historically reliable metrics. I have argued for nearly two years that a bull market predicated on the expansion of the Federal Reserve’s balance sheet cannot rise in a meaningful manner when the balance sheet itself stops growing. You may want to keep a healthy dollup of cash in your pocket to protect against the realistic possibility that risk assets struggle to stay at current levels. Care to take a stab at the prominent voice responsible for the admonition? It was President-elect Donald Trump. Perhaps ironically, Trump was a long-shot candidate aiming for an upset bid to win the White House when he made the remark. Now he is the President-elect. Yet the question remains… were the remarks little more than bluster at the initial debate with Secretary Clinton or did they accurately reflect the risk of financial loss moving forward? We can begin answering the inquiry by taking a look at traditional valuation measures. Doug Short from Advisor Perspectives aggregated the average of four popular valuation methods through the end of October. 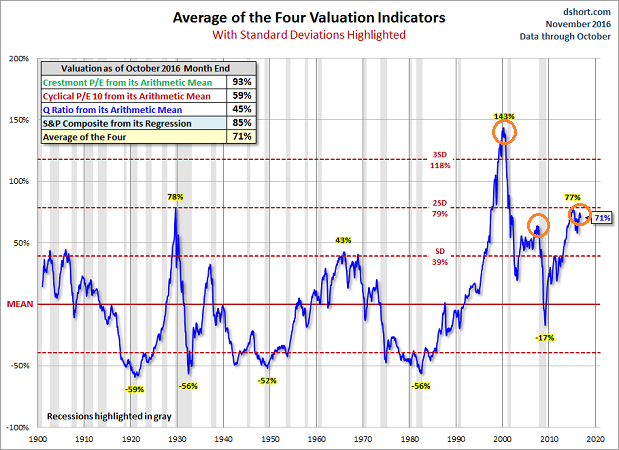 Not only are U.S. equities more overvalued on the average of these indicators than they were in October of 2007 before the financial crisis – not only are stock valuations close to two standard deviations above the collective mean – but the current circumstances have only been surpassed by the bull market tops in 1929 and 2000. In truth, the above-described findings are not particularly shocking. You can even replicate the findings with scores of less popular valuation techniques – market-cap-to-GDP, margin debt, price-to-sales, household equity percentage, household net worth as a percentage of GDP and so forth. Stocks have been trading at exorbitant prices across a wide range of historically reliable metrics. There is one “justification” for current stock prices. Specifically, bullish optimists maintain that ultra-low interest rates justify higher-than-normal stock prices. The argument is twofold: (1) Stocks are supposedly attractive when the earnings yield (E/P) is greater than the 10-year treasury yield, and (2) Stocks are attractive when dividend prices exceed the yield on the 10-year treasury. Unfortunately, as I have written about at length in the past, the “Fed Model” does not hold up particularly well in a historical context. First of all, there’s no such thing as an earnings yield in stocks. For instance, you do not actually lock in an earnings yield of 5.6% should the S&P 500 present a Forward P/E of 17.8. The E/P is entirely theoretical. Perhaps more importantly, those who have been arguing that the dividend yield is higher than the equity yield of the S&P 500 may need to reassess. The 30-day SEC yield for the S&P 500 SPDR Trust (NYSEARCA:SPY) is 2%. The 10-year yield? 2.14%. I do not agree with Trump’s notion that we are in a “big, fat ugly bubble” that is doomed to burst in spectacular fashion. I view the current environment as having very little upside reward for a whole lot of risk. I visualize a balloon that is not capable of taking in a whole lot of additional air, but one that may (or may not) see the gas leak slowly out of the rubber. It may even reflate after some leakage such that an epic balloon popping does not come to fruition. In this vein, I have argued for nearly two years that a bull market predicated on the expansion of the Federal Reserve’s balance sheet cannot rise in a meaningful manner when the balance sheet itself stops growing. Indeed, since the Fed ended the creation of new dollar credits in the 4th quarter of 2014, the total U.S. market in the Russell 3000 has barely gained ground. And the broad-based New York Stock Exchange? The NYSE Composite has actually lost ground over two years. By most accounts, the Fed intends to raise rates a little bit (0.25%) in December. More noticeably, the bond market itself has seen to the 10-year treasury yield rocket 50 basis points (0.50%) since Trump first made the declaration. So why haven’t stocks come crashing down yet? How far do those bond yields have to rise before stocks really do falter? Keep an eye on the U.S. dollar. If the Fed raises its overnight lending rate in December as most expect them to do, and if the dollar pushes above resistance levels as they did last year, an imperfect storm may develop. Specifically, an elevated dollar would hamper corporate earnings at a time when borrowing costs are moving higher. That may not be a pretty picture for equity enthusiasts. It has been fascinating to watch the mainstream media change its tune about the ways in which Trump would adversely affect the stock market. The truth? There are certain industries that may benefit from the President-elect’s proposals (e.g. defense contractors, resources, financials, etc.). There are other industries that may fare poorly (e.g., technology, alternative energy, hospitals, etc.). Nevertheless, U.S. stocks are still exceptionally pricey and higher bond yields may be difficult to overcome. Live by the rate manipulation sword, die by the rate manipulation sword. It is also is worth remembering that year-over-year job growth peaked (2.3%) near the time that the Fed finished its QE program. It is down to 1.7% today. A similar peak occurred in job openings near the tail end of 2014. The bottom line? Those who did not see their livelihoods improve during our slow-go economic recovery may hope that President-elect Trump can deliver the goods. And investors may hope that a Trump presidency will enhance their portfolio prospects for years to come. On the flip side, hope has a whole lot of headwinds in its path. Exorbitant valuations. Fed policy uncertainty. Interest rate pressure. You may want to keep a healthy dollup of cash in your pocket to protect against the realistic possibility that risk assets struggle to stay at current levels.